Please be aware that on Monday 12th August we will be implementing an important upgrade to our Library Management System. Beginning at 10pm the upgrade is likely to take around 3 hours. During this time Library services will be unavailable. We have chosen this late time to reduce disruption as far as possible. 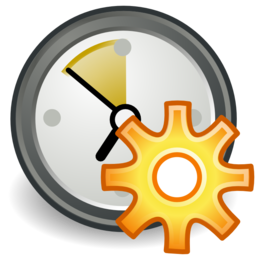 The Forum Library is not currently open 24/7 so hopefully the short period of overnight downtime will prove to be of minimal inconvenience. But if you do prefer to use our services remotely overnight please keep in mind the short period in which our services will be unavailable. We anticipate full service will be restored during the morning of Tuesday 13th August although the system will be subject to testing for a short period. This should not affect access but please do contact us if you are experiencing any difficulties during this time. This entry was posted in Using the Catalogue and tagged improvements, upgrades on 6th Aug, 2013 by reg206. Extended Sunday Opening Hours for St Luke’s! We Did…. From this Sunday and for the duration of the exam period St Luke’s Library will opening on a Sunday at the new earlier time of 10.00 AM! 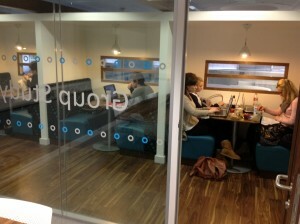 And don’t forget the out of hours study room and computer cluster are available by swipe access 24/7 all year round. 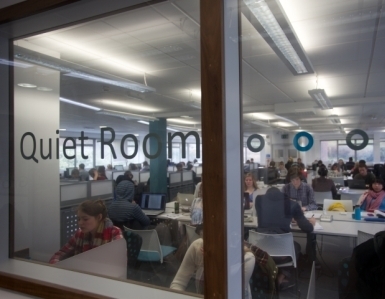 If you’ve not studied at St Luke’s before why not make a visit during the exam period: the Library offers, a designated Quiet study room, perfect for revision, as well as drop-in group pods and a larger group room bookable via the central student room bookings system. For more information on St Luke’s Library and how to get there please see our webpages. or speak to any member of staff directly. We’re always keen to hear your views! This entry was posted in Luke's Library and tagged improvements, St Luke's, study spaces on 25th Apr, 2013 by reg206. This popular space which provides a mix of quiet and group study is now available from 8AM – Midnight every day until 2nd June. Swipe your card to enter. From 28th April the Seminar wings on level +1 and level 0 will become part of the Library, available 24/7 for quiet study and increasing our capacity to over 1000 study seats. Enter the seminar wings through the Library (entrance by the computer clusters) from 28th April. To prioritise quiet study the group room on Forum Library +1 has become a quiet revision space from for the duration of the exam period. Group work spaces are still available in the Neil Cross and Vale Rooms, or why not book online a group room in the Amory Study Centre or the Forum Student Services Centre? We are extending the opening hours of St Luke’s Library and for the first time the Library will be open on Sunday mornings! 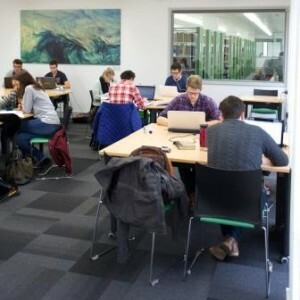 St Luke’s already offers a 24/7 computer cluster and study room but to further increase study space and access to our collections we will be opening the Library itself from 10.00 on Sundays (rather than our regular time of 14.00) from 28th April on a trial basis. This entry was posted in Luke's Library and tagged Forum Library, improvements, St Luke's, study spaces on 22nd Apr, 2013 by reg206. Amory Study Centre – extended opening hours! 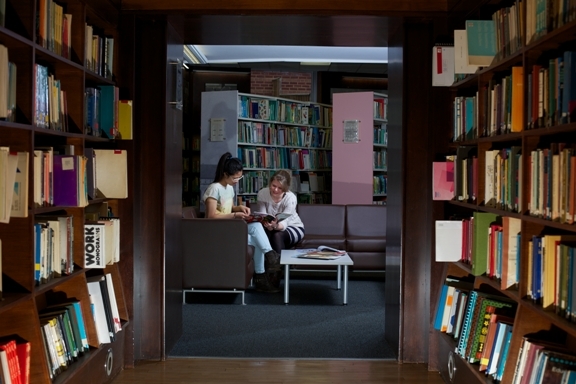 We are pleased to announce that this popular study space will be staying open later during the Summer exam period. From Sunday 21st April – Sunday 2nd June the Amory Study Centre will be open daily from 8am to the new later time of midnight! Please note this space is swipe access only so please always bring your University card with you. If you are planning to study late at night do keep safety in mind when you leave our Libraries or study spaces. Why not check out our revision tips blog post for more ideas on working smart and looking after yourself during the revision period. 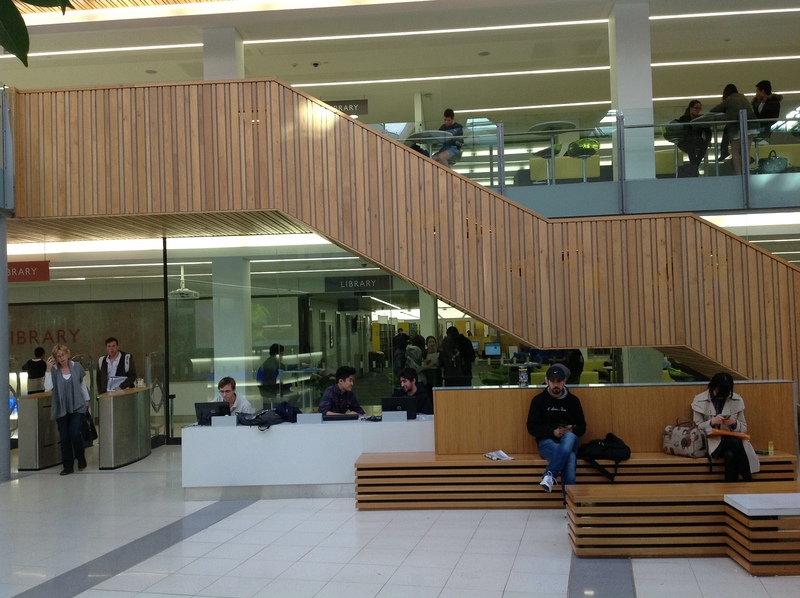 This entry was posted in Study Spaces and tagged improvements, study spaces on 19th Apr, 2013 by reg206. We know it’s very busy in the Forum Library at the moment, that’s why we’ve added some temporary additional seating in the Balcony space on Level +1. So please keep this area in mind if you’re looking for study space over the next few days. If you’re still struggling to find a seat please ask Library staff for help, or why not try one of our other Library Study Spaces such as Research Commons, The Sanctuary, The Amory Study Centre or St Luke’s Library? 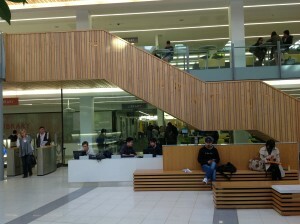 This entry was posted in Study Spaces and tagged Forum Library, improvements, study spaces on 5th Dec, 2012 by reg206. Library Survey – Last Few Days! We’ve arranged for the Seminar Rooms on Level 0 to be open until 9pm on Saturdays and Sunday. We now display maps that show the Dewey System, so that classmarks can be more speedily located in St Luke’s library. This year we’ve doubled the budget so Champions can buy more books than ever before! We spent 250k last year and are spending the same again this year on new print and online resources. 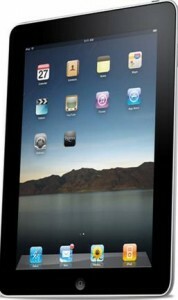 ….You might even win an iPad! iPad winner will be chosen through a prize draw after the survey closes – will it be you? This entry was posted in Events and tagged improvements, LibQUAL survey on 26th Nov, 2012 by reg206. One message that is emerging clearly from recent feedback via Library Comments cards and, of course, from the Library Quality Survey is that current students would like more study space available during evenings and weekends. As a result of student feedback we have already been able to open the seminar rooms on Forum Level 0 on Saturdays and Sundays. Additionally, we can now report that the Library has also arranged extended opening hours for the increasingly popular Amory Study Centre. Located in the Amory Building on Rennes Drive, the Amory Study Centre offers 240 seats and supports a range of learning needs, including group work rooms and quiet study areas. Amory is open to all students from 8.00 7 days a week. From Monday 26th November the space will be available for an additional hour and a half every day, now closing time at the later time of 21.30. So if you haven’t visited the Amory Study Centre yet why not give it a try in the coming week: now open later, until 21.30 every day! Please ask Library staff for directions or if you need help finding or using any of our study spaces. Changes like this one are the direct result of your feedback. Library staff are keen to hear your views and you can send us an email or fill in a comments card all year round, but the Library Quality Survey is still running until November 30th so if you haven’t done so already please take the time to click here and share your views. We hope the next improvement to our service will be the one YOU suggest! This entry was posted in Study Spaces and tagged improvements, room bookings, study spaces on 25th Nov, 2012 by reg206. Additional Weekend Study Space in the Forum! Through the Library Survey you told us you needed more study space at the weekend…..
….We listened, and took action! We are pleased to announce that from this weekend (Saturday November 24th) additional study space will be available in the Forum. The seminar rooms on Forum Level 0 have previously been closed at the weekends but, in response to high demand from students, the Library has now arranged for these to be opened up to be used for study. This change has been made as a direct result of student feedback and is fully supported by Campus Services and Estate Patrol. The seminar rooms on Forum Level 0 are accessible directly from the Forum Street, rather than through the Library and will now be usable as drop-in study spaces until 9pm each Saturday and Sunday. Please ask Library staff if you need further directions. As we hope this shows, your feedback is important to Library staff and we are constantly looking for ways to improve the service we offer, so do let us know if there are other ways we can enhance your learning experience. Currently the best way to do this is by completing the Library Quality Survey, which is still running until November 30th 2012. Please click here for further details, and to start the survey. Your comments make a real difference and you could win an iPad too! 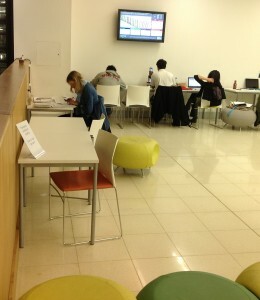 This entry was posted in Study Spaces and tagged Forum Library, improvements, study spaces on 22nd Nov, 2012 by reg206.